How mental illness changed human history - for the better: David Whitley at TEDxManhattanBeach. The End Chamber's monumental panel, twelve metres long, is organised around a central alcove in which a small horse has been drawn. To the left, the Panel of Rhinoceroses and to the right, the Panel of Lions. 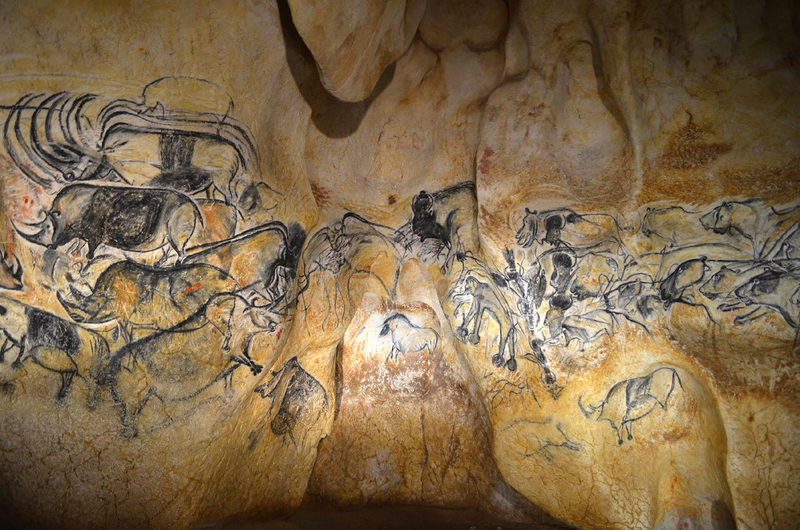 As presented in the Pont-d'Arc Cavern, the name given to the reproduction of Chauvet-Pont d'Arc. Archaeologist David Whitley suggests that the strengths and weaknesses of humans are deeply intertwined and inter-dependent. He shares his journey, taking us back 40,000 years, to discover the origin of human artistic genius. Recent genetic research on mood disorders indicate that three of the gene variants that control our serotonin and dopamine systems mutated between 40 and 50 thousand years ago; essentially at the same time as this first 'great' art. Engravings made by fingers in the Hillaire Chamber. As presented in the Pont-d'Arc Cavern. In other words, the genes that control mood disorders essentially appeared at the same time as artistic genius. We can therefore infer that artistic genius is partly a function of genetic mutations, and of of 'mental illness'. By extension, ‘mental illness’ changed human history. Or is it ‘gene enhancement’? Subsequent to the TEDx talk, Whitley explains that geneticists have determined that one of the genes implicated specifically in depression was inherited from inter-breeding with Neanderthal. In other words, outside of Africa during the early Upper Paleolithic. A process called a genetic sweep could easily have passed this trait across the world. He emphasizes that mood disorders are complex diseases; no single genes cause them, and environmental factors always play a part.